The Gram-negative bacterium E. coli is the workhorse of molecular biology, regularly used as the first choice host for DNA cloning, small-scale protein expression, and large-scale protein production for FDA approved biologics. 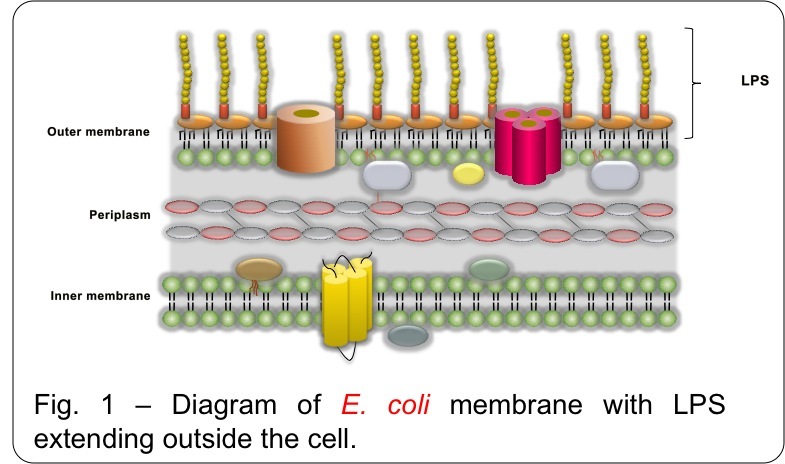 One of the major limitations in using E. coli relates to the lipopolysaccharide (LPS) component of the outer membrane. LPS is an endotoxin that is a potent activator of many immune cells through the Toll-like receptor-4 (TLR4) and can directly trigger endotoxic shock (septic shock), resulting in severe medical problems and death. Such a toxic component requires extensive, and expensive, removal during protein purification. In addition to medical applications, LPS is unwanted in basic research that involves human cells and tissue as the presence of endotoxins frequently results in toxicity that interferes with results. Current methods for endotoxin removal are varied, including ultra-filtration, activated carbon, surfactants, anion exchange chromatography, and immobilized sepharose. Each of these strategies involves negative effects: significant yield loss, high cost, loss of bioactivity of the protein, or bioactivity of the additives used for endotoxin cleanup. Endotoxin/LPS IntroductionIn E. coli, there are ~2 x 106 LPS molecules per cell, accounting for 30% of total outer membrane gross weight (see Figure 1). In mammalian cell culture, LPS contamination triggers secretion of pro-inflammatory cytokines, poor cell growth, reduced DNA transfection efficiency, problematic differentiation, cell death, and compromised experimental results. In humans, LPS activates the immune system, resulting in endotoxic shock or even death. In E. coli, there are ~2 x 106 LPS molecules per cell, accounting for 30% of total outer membrane gross weight (see Figure 1). In mammalian cell culture, LPS contamination triggers secretion of pro-inflammatory cytokines, poor cell growth, reduced DNA transfection efficiency, problematic differentiation, cell death, and compromised experimental results. In humans, LPS activates the immune system, resulting in endotoxic shock or even death. There are multiple different methods for endotoxin removal, all of which have disadvantages. Eliminating LPS from the E. coli outer membrane is a much more desirable pathway to clean recombinant proteins, which can lead to new E. coli strains that are useful as research tools and potentially as a protein production platform for therapeutic proteins. Lucigen and Research Corporation Technologies have developed a new line of E. coli competent cells called ClearColi. These cells have been genetically modified to remove the immune response triggers associated with LPS while still retaining viability and protein expression capabilities. By eliminating the offending LPS, purification of recombinant proteins for downstream cell-based assays is reduced to a simple process such as a nickel column. Immune response data from multiple methods for endotoxin detection will be presented, demonstrating that proteins expressed from this novel cell line cause virtually no inflammatory cytokine production without the need for endotoxin removal treatments.